After two hours of sitting on the ferry, listening and watching Vietnamese pop music videos, the Harrington's were able to see the first signs of land, an island to be an exact. 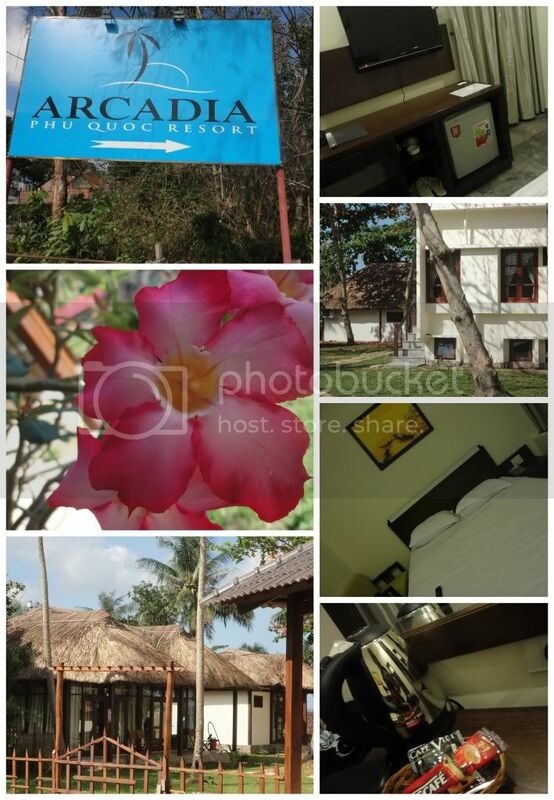 Phu Quoc Island for greater accuracy. Having been in charge of booking a few accommodations prior to arriving in Vietnam, Mike had amazingly managed to keep the couples hotel location, name and perks a secret from the Mrs. Unfortunately, the taxi driver wasn't as keen on keeping things secret as he desired to get the couple to their final destination on Phu Quoc Island. With another traveling couple, the Harrington's then loaded a taxi and made their way to Long Beach where the Harrington's would find themselves spending the nights at Arcadia Resort, recently built and boasting beautiful grounds and beach access, it was a nice step up for the ever frugal M and M.
With a few hours separating the couple from dinner time, they quickly unloaded their single packs and made way for the beach. 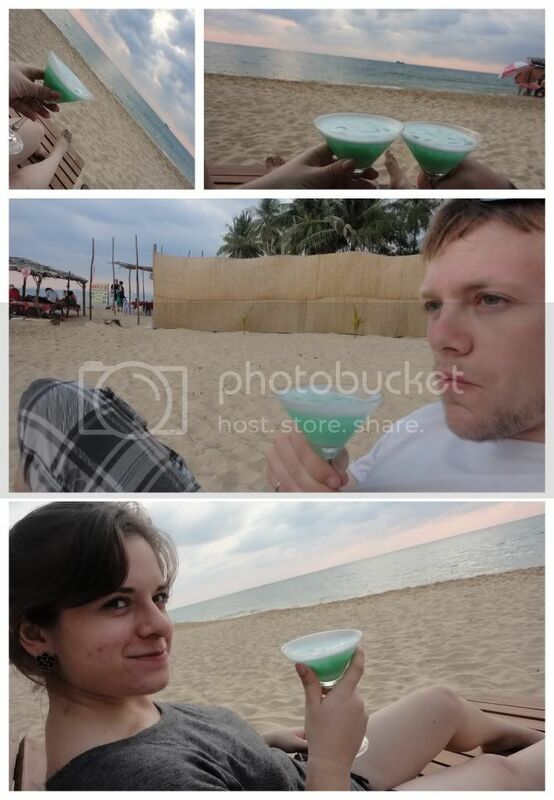 Their arrival on the beach perfectly coincided with Happy Hour and the sunset, so it was, with a Grasshopper cocktail in hand, the Harrington's began their relaxing, rejuvenating and slightly luxurious stay on Phu Quoc Island. With the sun dipped below the horizon the couple set out to find a romantic dinner spot to celebrate the joy of simply being together, on vacation and in a place of beauty. Within minutes of walking, Melissa noted a sign for Le Bistro, a French Cafe recommended by Lonely Planet as providing delicious French and Vietnamese cuisine. 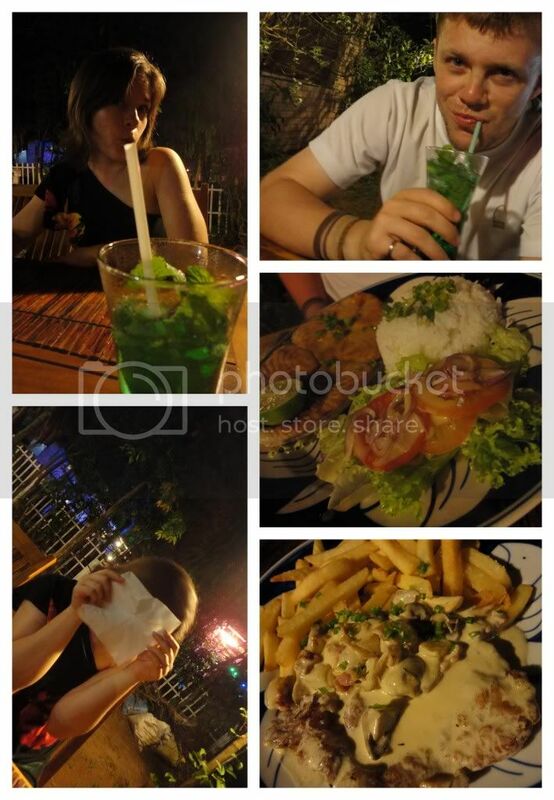 An added bonus for the evening was that the couple arrived right on the tail end of Le Bistro's happy hour and so enjoyed 2 Lemon Rum's for the price of 1 (less than $1US). Aside from Happy Hour however, the couple enjoyed a most fantastic meal which began with a raw tuna salad, seared tuna steak and rice for the man and a pork chop with a creamy bacon and mushroom gravy with french fries for the lady. Overly stuffed, the couple had to turn down tempting desert items such as ice cream wrapped in puff pastry with chocolate sauce, and contentedly made their way back to Arcadia for a restful evening in paradise.